The German did not make the substitutes’ bench for the League Cup quarter-final defeat to rivals Tottenham on Wednesday and has been on the fringes of the team in recent weeks. 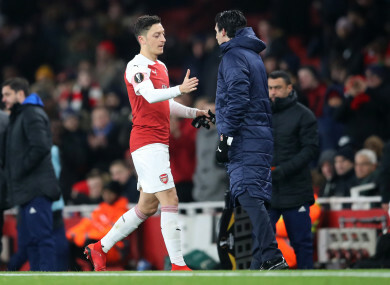 Mesut Ozil shakes hands with manager Unai Emery after being substituted during Arsenal's Europa League win over Qarabag. Ozil did not make the substitutes’ bench for the League Cup quarter-final defeat to rivals Tottenham on Wednesday and has been on the fringes of the team in recent weeks. The German has missed four recent games with a back problem but has started just once since November 11 – and that was a Europa League dead rubber at home to Qarabag. Every player wants to play and be OK to help the team when we need. The frustration is the same for everybody when they didn’t play in a match. “But I spoke with him and with regularity in the season. I am telling him what we need from him and he has the commitment to help us and the quality and the characteristics to help us when the team needs his moments in the pitch in one game. Email “'We need Mesut Ozil': Unai Emery insists midfielder has a future at Arsenal”. Feedback on “'We need Mesut Ozil': Unai Emery insists midfielder has a future at Arsenal”.